The above images are all from this amazing website Swatch and Learn – please go check the original post for full details!! China Glaze “Optical Illusion” with my glitter removal technique. China Glaze “Optical Illusion” from their Prismatic collection. This is one of those incredibly beautiful polishes, that I would normally use once and then stare at it longingly after that, because it is such a pain to remove! And in the words of Julie Chen (you US Big Brother fans know what I mean) “But First….” 🙂 here are some pictures of the mani! Pardon the above pictures – I was trying my best to show the the various glitter colors, sizes and glitter’iness. The basic idea is, take regular white school glue and fill up an empty polish bottle. Prior to any glitter polish use, apply glue as the base, just as you would a regular base. Starting the removal, I use a rubber cuticle pusher to nudge a corner of the polish until it starts to pull up. Keep gently pushing off polish until it is falling off. If you have applied enough glue, you should be able to remove just about all of the glitter polish – but you may have teeny bits and pieces left on. A bristle nail scrubber usually takes the rest off. The Ghoulish Glow even glows when the lights are low! It doesn’t have to be really dark! Awesome! Roguish Red, Bizarre Blurple (love the name!) with Glitter Goblin stripe down the middle. “Glitter Smoosh” sponging with stamping! I started with a China Glaze “Mahogany Magic” base, and then just sponged on a bunch of different glitter or metallic polishes on top. My toppers! Topcoats and glitters galore! My own creation “noname” frankenpolish – with a glitter holo base, silver holo flicks, orange/blue duochrome flakies. 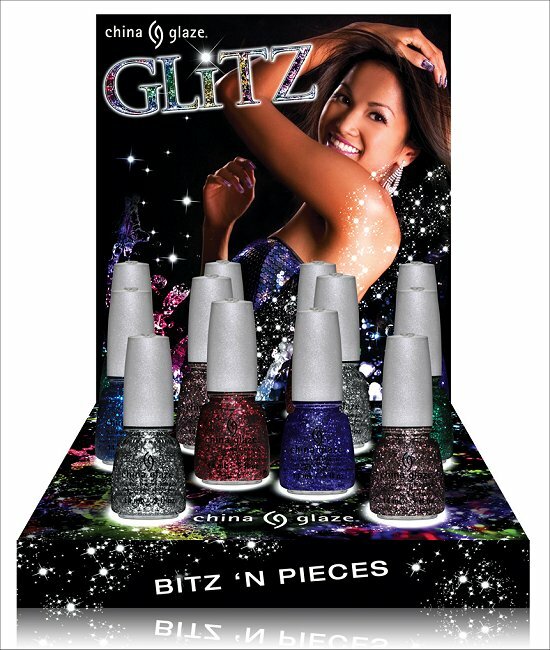 The polish is a mix of Layla Holo Mercury Twilight, China Glaze Fairy Dust, and a small scoop of holo sparkle dust. Have I mentioned….. I LOVE GLITTER!! !